File photo of SCP-3019 shortly before Incident 3019-F1-A in 2010. Site-919 has been established in close proximity to SCP-3019 under the guise of a telecommunications hub to monitor any attempted intrusion into SCP-3019. Foundation Personnel are to apprehend any civilian attempting to enter SCP-3019 after sundown for questioning. Questioned civilians are to be administered class C amnestics and released. Foundation personnel are not to enter SCP-3019 after sunset without Level-3 approval. Site-919 has been established in close proximity to SCP-3019 under the guise of a telecommunications hub. Following Incident 3019-F1-A, SCP-3019 is to be kept running and operational. A minimum of three Foundation agents are to be embedded into each department of SCP-3019 as employees for monitoring purposes and to ensure all employees within SCP-3019 vacate the property a minimum of one hour before sundown of each day. Foundation staff are to be installed under the guise of private security outside the boundary of SCP-3019 at least one hour before nightfall each day to deter any potential intruders. Under no circumstance is any intruding civilian to be followed into SCP-3019 after sunset. In the event a civilian survives a night in SCP-3019, they are to be questioned and administered Class-C Amnestics and released if appropriate. Cleaning crews are to remove any evidence of SCP-3019-A's activities before the arrival of the employees working at SCP-3019 during the day, who may not enter the grounds before 8:00AM. SCP-3019's effects are not apparent in the day, and as such the Nursery is allowed to operate in this time. After sunset, however, SCP-3019 enters an active state. Approximately 45 minutes after sunset, SCP-3019-A manifests somewhere on the property of SCP-3019. SCP-3019-A is a humanoid entity standing at 1.96 metres tall with forearms appearing to be extended via wooden growth and with a severely scarred face capable of peeling back into six petal-shaped flaps via embedded vines emerging from the eye sockets, nasal passages and mouth of the skull. 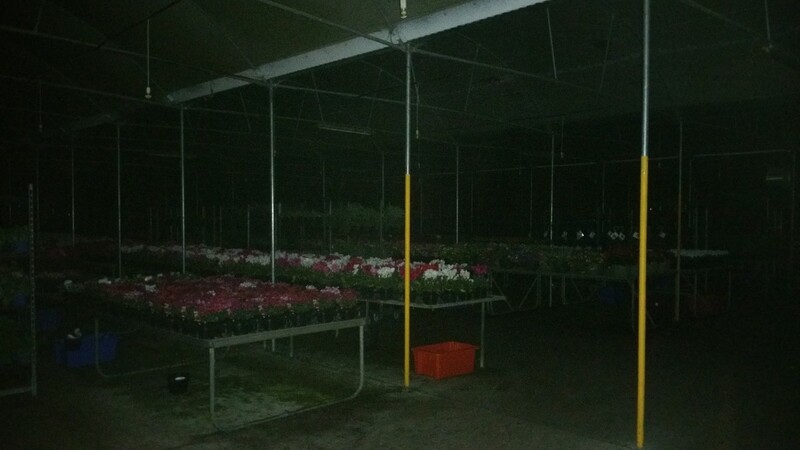 SCP-3019 does not appear to be impaired by low-light conditions, has been seen using tools, and has displayed extensive knowledge of horticulture. SCP-3019-A has proven capable of lifting weights in excess of 600 kilograms through use of muscles reinforced with plant cells more resistant to tearing as well as surviving typically fatal injuries via unknown means. Upon manifesting, SCP-3019-A will run through a routine composed of watering the plants, meticulously searching for any sign of pests such as caterpillars or mold, pest extermination, temperature regulation, mulching collected cadavers into fertilizer, application of fertilizer, followed by watering once more. It has been seen emitting a potent hereby unknown pesticide in the form of a gas for the purposes of pest control. When any human or certain animals1 enters the property of SCP-3019, SCP-3019-A will enter a markedly hostile state. It will immediately move to the human or animal in question by the most direct path possible without disturbing the plants. How SCP-3019 is capable of locating intruders without sensory organs is unknown. Upon locating the intruder, SCP-3019-A will attempt to disable them by bludgeoning with agricultural tools. It will then relocate the remains to the potting area of the nursery, where it will convert the remains into blood and bone fertilizer to be applied to the plants within SCP-3019. This is typically done by crushing the intruder with constricting vine like growths before feeding them into mulching units. Depending on the mass and strength of the intruder, this process can take between 1 and 4 hours. The following events occurred shortly after the Foundation's acquisition of ██████'s Nursery on 27/10/2009 following the disappearance of 84 employees during work hours and subsequent discovery of SCP-3019's anomalous features. Initial containment procedures called for the closure of ██████'s Nursery, and were seen to be sufficient to contain the anomaly. On the 4/2/2010, the following events called for the revision of containment procedures. Following sundown and the manifestation of SCP-3019-A on 9/1/2010, Foundation surveillance on the interior of SCP-3019 observed SCP-3019-A behaving in an uncharacteristically distressed nature, seemingly in response to the poor condition of the plants within SCP-3019's borders. At 09:10PM SCP-3019-A breached the perimeter wall and attempted to incapacitate 8 Foundation agents, who were able to retreat into the nearby woods, but were cut off from Command in doing so. SCP-3019-A's location was lost for 43 minutes. Mobile Task Force Theta-4 ("Gardeners") was dispatched to intercept SCP-3019-A, and reported sighting it in the woods between the town of █████ and SCP-3019. Radio contact was lost at 10:01PM. At 10:21PM, SCP-3019-A re-entered SCP-3019 whilst dragging 19 civilians and Foundation personnel restrained in a mass of vines. Agent Matthews was able to break free from SCP-3019-A's hold and attempted to escape, but was stabbed in the abdomen by SCP-3019-A and injected with an unknown substance. This resulted in the same vines used to restrain SCP-3019-A's captives rapidly growing from Agent Matthews' wounds and orifices. SCP-3019-A was able to successfully transport 6 of the captives alive into SCP-3019's office facility. When Theta-4 agents attempted to gain access to this building, the doors and windows were unable to be opened, forcing the removal of a section of wall on the southeast corner of the building. Following SCP-3019-A's tracks, they found the layout of the building disorienting and inconsistent. Analysis revealed that no psychoactive substances were present in the air as previously suspected, at which point the decision was made to withdraw the team. At 7:45AM on 11/1/2010, Theta-4 agents were able to access the office building basement area of SCP-3019, but found nothing. SCP-3019-A manifested normally and proceeded without incident to continue its daily routine. At 9:10PM the same day, 6 humanoid entities exited SCP-3019's Chemical engineering building and begun caring for the plants in the same manner as SCP-3019-A. These entities resembled human beings with their skin replaced by flowering plants and soil. Root structures were fully integrated into the bodies, resulting in apparent brain death.2 DNA analysis confirmed that these entities were composed of the individuals SCP-3019-A had captured. All specimens were captured by Foundation personnel the following day for study. All specimens rapidly deteriorated upon removal from SCP-3019, and were promptly incinerated after perishing. As of the 16/1/2010, several previously unknown flowering plants have been discovered growing within the limits of SCP-3019 which display mammalian and human traits, including skin, rudimentary nervous systems, limited mobility and eyes. Analysis has shown that these flowers match DNA from individuals captured during Incident 3019-F1-A. Destruction of these specimens is currently pending. Following these events it was determined that ██████'s Nursery was to remain open and operational, with closures lasting no longer than four weeks at a time so as to avoid any possible repeat of this incident. Addendum 3019-1 On 21/10/2011 an unmanned drone equipped with infrared camera imaging was sent to film within SCP-3019 after sunset to determine SCP-3019-As response to mechanical equipment within SCP-3019. While SCP-3019-A proved unresponsive to the presence of the drone, a tattoo of an oak tree with elaborate roots turning to flowers upon its left bicep was observed by the drone's camera. This closely matches a tattoo on the left bicep of Emily Wood, who worked as a nursery hand at ██████'s Nursery until her disappearance on 3/10/2009. Investigation into this resulted in the discovery the following letter among the possessions of Miss Wood addressed to her on ██████'s Nursery stationery, addressed from Mr Erik ██████, The owner of SCP-3019 prior to Foundation Acquisition. Over the past 30 years, I have striven to make this into the most successful business possible. We are a hardworking team here, and with that hard work comes the benefits of profit and promotion through our ranks, and as such we very much value hard workers. You are not a hard worker. Every time I visit the Dispatch area I see you working slowly, sloppily and spending most of your time socializing with your coworkers. Despite multiple warnings, you remain a problem for me and the team at ██████'s Nursery, and we are sick of it. You have had your second, third and final warnings, and now it is time to suffer the consequences. Enclosed in this envelope is a little something I made to improve your work performance. Perhaps this experience will finally teach you the meaning of hard work and respect for your employers. We look forward to working with you for many, many years to come. Subsequent investigation showed trace elements of soil and unknown spores in the letter. Despite ongoing search efforts, the current whereabouts of Mr ██████ are unknown.